(Top) The Blue Knights low brass section rehearses at the recent Memorial Day camp, while (bottom) alum Leonard Robinson (left) and Gene Nuccio (right, a BK booster board member) "throw down" the barbeque. 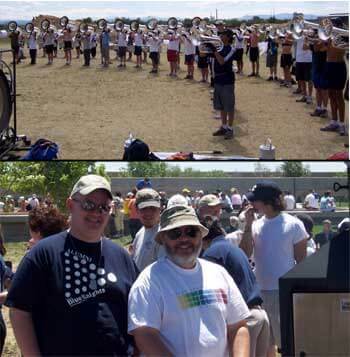 More than 300 people attended a Blue Knights open rehearsal/BBQ/potluck this past weekend in Denver. The Memorial Day BBQ/potluck is a 15-year tradition with the Blue Knights. This year the barbeque featured meat cooked up by Webmaster and BK alum Leonard Robinson. "One of the reasons we keep Leonard around is he owns a big, Texas-style barbeque pit on wheels!" joked Blue Knights director Mark Arnold. All parents, friends and alumni are invited to attend. The Corps gets a little extra time off from rehearsal to eat with everyone and the rest of the afternoon is spent watching rehearsals and attending various meetings (parent orientation, alumni and tour volunteers). The day is culminated with a performance of the corps for those in attendance. "It's always a great day for the Blue Knights," said Arnold. "We all get the chance to touch bases and get caught up on the lives of our past members and volunteers ... but of course the greatest reward is getting the chance to see the corps preview their new competitive program."